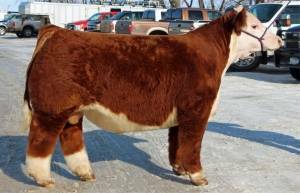 PB Hereford that is made like a clubby. He has that freaky look and powerful build that is desired in the club calf industry. Sioux Empire was the high selling Hereford bull at the Sioux Empire Farm Show and we expect him to move any PB program in a positive direction. Plenty of eye-appeal and the exceptionally stout.